Connect your instrument to the mixer without losing tone with the Behringer DI400P Passive Direct Box. Finally, you can connect your electric guitar or bass straight into a mixer without the worry of losing tone due to impedance mismatch, long cables or cycle hum. The DI400P features a high-performance transformer which allows for using very long cables without the loss of high frequency content. Additionally, the DI box converts any unbalanced line-level signal to balanced mic-level output. It features a Thru/Out jack that sends the unbalanced signal to an onstage amplifier while the balanced signal is routed to a mixer. 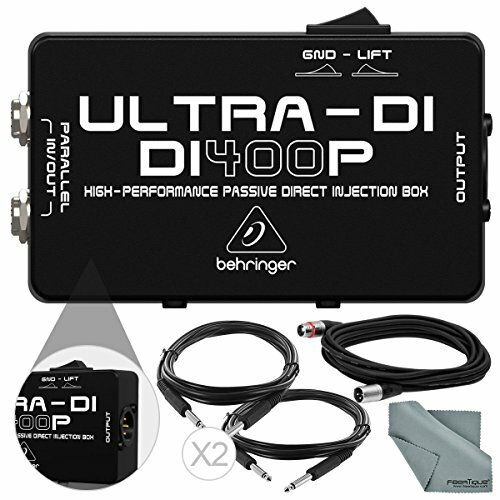 In a compact, all-metal and road-worthy housing, the Behringer DI400P Passive Direct Box will ensure that your sound is great at every performance.